The Pre-Hispanic City of Teotihuacan comprise the ruins of one of the first great classic Mesoamerican civilizations. A large city and ceremonial center, distinguished by the enormous size of its monuments. The major monuments at the holy city of Teotihuacan are believed to have been built around 200 AD. After that, the city flourished for 400 years, until a sudden collapse in the middle of the 7th century. All in Teotihuacan is centered around the Avenue of the Dead, the long and wide road that connects La Ciudadela with the Moon Pyramid. About half way, the Sun Pyramid can be found. This is the third biggest pyramid in the world: it measures 225 x 225m, and has a height of 63 meters. There are 5 platforms. Underneath the structure an entrance to a small cave has been found: it is thought that the sun was worshipped at this place before the pyramid was built. Impressive and mysterious, these pyramids that you automatically connect with Egypt. Probably Erich Von Däniken will have a theory about this (green people from the moon built both the pyramids in Egypt and Mexico or something like that). When you walk around sites like these you want to know more: how did these structures fit into the lives of the people? what religious activities took place here? 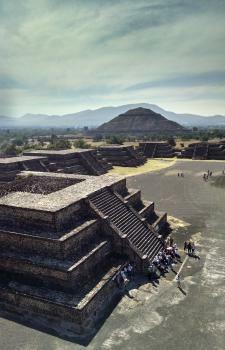 Unfortunately, not much is yet known about Teotihuacan. It is hard to add more to the reviews already here. The pyramids really are an impressive spectacle. Aside from them I really enjoyed the citadel, with its magnificent temple of the Feathered Serpent and also the Palace of Quetzalpapalotl near the Pyramid of the Moon was very worthy of investigation. We got there fairly early to avoid larger crowds and brighter sun shine, and it worked to an extent. The climb up the Pyramid of the Sun was certainly a lot quieter at nine than it was an hour or so later. However the long hot trek back to gate one started to bring flash backs to our near melting at Volubilis, It was made slightly worse by finding out return buses actually depart from gate two, where we had just walked from. There was a slight improvement in circumstances though as our bus stopped at the metro(bus) station Indio Verdes, which made our trip back to the hotel much easier, and may be of more use for others travelling to/from Mexico City. A week or so later we got a wonderful view of the pyramids appearing above fields of cacti as we drove in from the Aqueduct of Padre Tembleque. In a piece of good timing, shortly before our visit we were able to brush up on our history thanks to an episode of the BBC's Lost Kingdoms of Central America which was devoted to Teotihuacan. We spent a good 5 hours exploring this vast WHS. 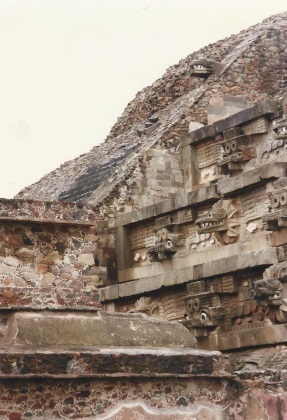 Teotihuacan is a place that you should consider careful planning. Firstly, besides what you may find online, its open on Monday. Secondly, prepare for the sun and purchase water. Thirdly, don't think the Pyramid of the Sun is the only highlight of this huge site. Lastly, arrive early before the buses of tourists and vendors. Despite these realities, the site is so vast the numbers make no difference unless you are hiking up the Pyramid of the Sun after 11am. The best view of the site, is without a doubt from the Temple of the Moon looking out over the Avenue of the Dead and the Pyramid of the Sun. Nearby, is a ruined palace site that includes original (& recreated) paintings of this ancient Mesoamerican culture. I very much enjoyed my time visiting this site, and it should not be missed by anyone who visits Mexico City. On a side note, the Aqueduct of Padre Tembleque is located somewhat near Teotihuacan. At this point I know of no easy way to visit both WHS using public transit in one day. Yet, I am sure this will eventually become a reality. 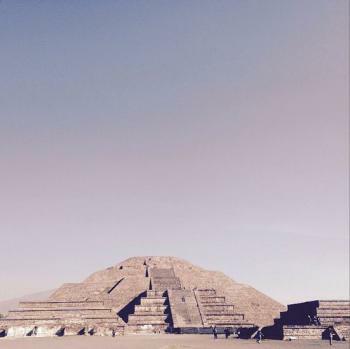 Seemingly, an inevitable tourist activity when visiting Teotihuacan is hiking the Pyramid of the Sun. The view is certainly special and the climb makes you appreciate the size and labor involved in its construction. If its very busy, consider other views and places to explore, but if you have the time, inclination, and water you might want to make the attempt. I did not know why I suddenly woke up at 3AM in the morning, maybe because of tequila I drank last night or the sound of mariachi band that still lingered on my head. Since I could not sleep, at 5AM I used the first metro train of that day to Norte bus terminal, and at 6 AM I was the only passenger on the first bus to Teotihuacan, then at 7.15 I was the only one at the third gate of the historic complex and the guard had to ask me to use second gate instead as no one here to sell the ticket! At 7.30 I was the first tourist of that day to be at the second gate, the gate that directly in front of the famous Pyramid of the Sun. The sun was sparklingly shining behind the pyramid and balloons appeared beside the silhouette giant ancient man made engineering masterpiece. The first image of Teotihuacan really made me happy and full with wonder of its mystery. I directly walked to the pyramid, crossed the impressive Avenue of the Dead and climbed to the top. 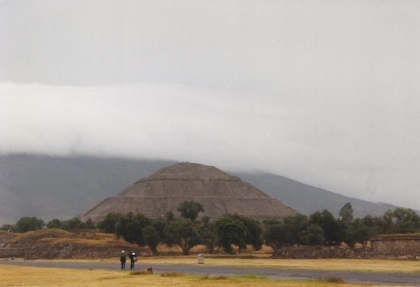 It was a great experience to be with this great structure alone, and when I was on the top of the pyramid, the cool breeze of late autumn and the sea of mist making the whole valley of Teotihuacan more unworldly to my eyes. I was on the top of pyramid bathing the ray of light from the sun, until I noticed a group of tourist started to climb the pyramid that I decided to continue my journey. 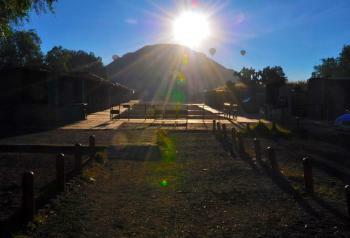 I backed to the Avenue of the Dead, admired the grand view of Pyramid of the Moon and its many small pyramid platforms. Since I arrived early, vendors were still not come to set up their shops, so the view of this famed avenue was truly breathtaking. 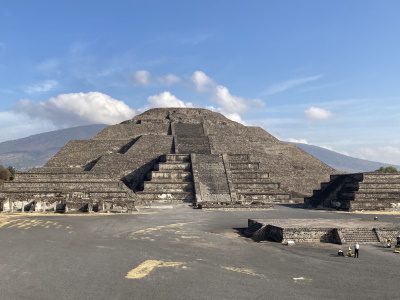 When I was at the Pyramid of the moon, at first I wanted to climb to the top but found out that only lower platform was allowed, but from that platform, the view of the avenue and Pyramid of the Sun were again impressive and indescribable. After enjoyed both pyramids I also visited the ruins of ancient palace near the Pyramid of the Moon, the palace is still preserved ancient wall paintings and nice sculpted columns. I finished visiting Teotihuacan at 11 AM the time that the Avenue of the dead was full with tourists and small souvenir shops, an image that so contrast with the serene landscape when I was at 8 AM. I went to gate 1 and took a bus back to Mexico City and safely arrived after lunch time shortly. From all World Heritage Sites I saw during my two weeks holiday in Mexico, Teotihuacan is my favorite site. The site is simply amazing, in my opinion, that it still preserved its sacred characteristic on its architectural design and surroundings, better than other well-known site like Chichen Itza or Tulum. If I have to recommend a site to visit in Mexico City's vicinity, Teotihuacan will be my first suggestion since it is truly a must see. As a Mexican, being at Teotihuacan is a very deep sentiment. People in charge of the site are doing a good job (yet there is always room for improvement)and we the people need to help too. I was disappointed to see people on the top of the Sun's pyramid which contributes to its deterioration. I wonder if we even should step on the stairs of the pyramids. As comparing Teotihucan with Egypt's pyramids, they are different yet they are great gifts of cultures that are remaining us the greatness of the human mind. Read more from Luna sin Estrellas here. Oh my God! the most religiuos, amazing experience of my life! Liquid Mercury: In 2003, a tunnel was discovered beneath the Feathered Serpent pyramid in the ruins of Teotihuacan.... Undisturbed for 1,800 years, the sealed-off passage was found to contain thousands of extraordinary treasures lying exactly where they had first been placed as ritual offerings to the gods. Items unearthed included greenstone crocodile teeth, crystals shaped into eyes, and sculptures of jaguars ready to pounce. Even more remarkable was a miniature mountainous landscape, 17 metres underground, with tiny pools of liquid mercury representing lakes"
Human Sacrifice: Bodies of what appear to be sacrificial victims have been found within the Temple of the Moon.